Gloria Cohen Shomo (EA 2008) -- Digital Coordinator on Life of Pi. Gloria Cohen Shomo has been very busy in Hollywood since graduating with a degree in Electronic Arts from Missouri State in 2008. Gloria has worked as the visual effects coordinator on a number of major feature films, including Little Folkers (2010), Moneyball (2011), Alvin and the Chipmunks: Chipwrecked (2011), and Percy Jackson: Sea of Monsters (2013). 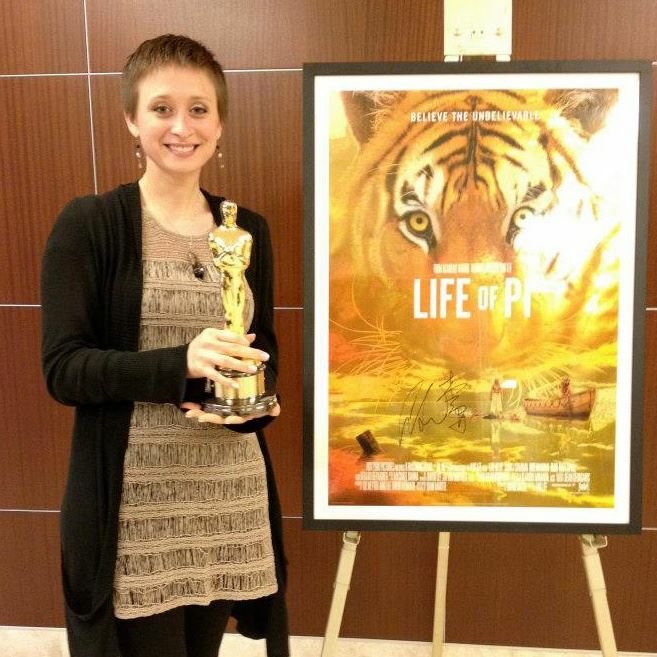 Most notably, she served as the digital coordinator on Life of Pi, which won the 2013 Academy Award for Best Achievement in Visual Effects, Best Director, Best Cinematography and Best Original Score. Gloria will return to MSU for a Master Filmmaker Screening on Friday, October 18th. She will screen Life of Pi and conduct a talk-back session following the film from 7-10 p.m. in MSU’s Plaster Student Union Theatre. On Saturday, October 19th, Gloria will also participate in the Homecoming Celebration being hosted by the College of Arts and Letters. She’ll be a part of the alumni panel on “Making the Most of Your First Professional Opportunity,” at 11 a.m. in Craig Hall on the southeast corner of MSU’s Springfield campus. These events are free and open to the public. We’d love to have you come meet and hear what Gloria has to share with us about her experiences working in Hollywood.